" Help The BRAD BLOG and Get a Signed Copy of Greg Palast's 'Billionaires and Ballot Bandits' AND His 'Election Files' DVD as Thanks!	" 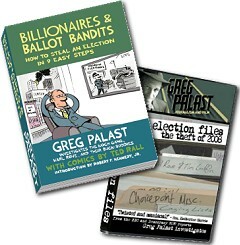 Help The BRAD BLOG and Get a Signed Copy of Greg Palast's 'Billionaires and Ballot Bandits' AND His 'Election Files' DVD as Thanks! Covering this insane election season 24/7 means that I've had little or no time to try and raise funds to help keep our expenses in even minimal check here. I'm also lousy at it. I'd rather cover and break the news than raise money to help pay for doing it. As you hopefully know, The BRAD BLOG does not receive any corporate or foundational support. We are 100% independent and need to stay that way. But that also means you guys need to help us out, if we are to keep the lights on here all. Our muckraking BBC buddy Greg Palast has noticed the bind we're in, and has generously offered to try and help us out once again! He's given us a limited number of signed copies of his very cool, New York Times best-selling new book, Billionaires & Ballot Bandits: How to Steal an Election in 9 Easy Steps (featuring an intro by Bobby Kennedy Jr., a new comic book by Ted Rall called "Tales From the Crypt of Democracy" in the middle of it, and a list of "7 Ways to Beat the Ballot Bandits" at the end) to make available as premium offers to those who contribute $75 or more to The BRAD BLOG right here. Again, we don't have a lot of these available, so it's first come first serve. But if you can help us out with a donation of $75 or more, we'll try to get both the signed Palast book (featuring his investigations of "the Koch Gang, Karl Rove, and Their Buck-Buddies") and his DVD off to ya ASAP, so you'll have both before the election! Best way to get your signed copy of Greg's new book and his DVD is to donate here online with Credit Card or PayPal. (If you work quickly, you can also send a check via snail mail to: Brad Friedman, 7095 Hollywood Blvd., #594, Los Angeles, CA 90028). My great thanks in advance to any of you who can help us out here and, of course, to the good Mr. Palast! « PREVIOUS STORY "2nd 2012 Presidential Debate Photo Caption Contest of the Moment..."
"Help The BRAD BLOG and Get a Signed Copy of Greg Palast's 'Billionaires and Ballot Bandits' AND His 'Election Files' DVD as Thanks!" Yes I have, John. Been trying to learn more about it all day. Will let you know if I have anything to offer, of course. "featuring an intro by Bobby Kennedy Jr."
Yup...just a regular guy kick'in around the five and dime. Middle class family fer sher!